The quest for cheap RC airplanes... We've all been there... We've scraped together every last penny to pay for that perfect RC airplane. Only a short time later we crash it and are left broke and without a plane to fly. It's a terrible feeling. After the crying has stopped, we immediately begin our search for a replacement bird. At this point we're not looking for the best RC airplane, we're looking for a decent quality RC airplane for a rock bottom price! We're looking for a decent plane to get us in the air without causing a divorce! I've been in this predicament a time or two... Below are some decent quality RC airplanes that will get you in the air in a pinch. As a matter of fact, some of these "cheap Airplanes" have turned out to be some of my all time favorites! When I crashed my Sig Four Star, I was devastated. Not only was this my first kit build, it was the only plane I had at the time! I scoured the internet trying to find a cheapest RC airplane possible to transfer my engine and radio to. I thought the price seemed too good to be true, but I ordered it anyway. The airframe was not quite at sturdy as my Four Star, but it did the trick! This plane literally flies better than the Four Star! I liked it so well I immediately ordered another one as a spare! Seagull Model's Space Walker II is another relatively cheap RC airplane that hangs proudly in my hanger. Seagull didn't spare anything when it came to the quality of this bird. It's sturdy built, nicely covered and flies great! It's a mystery to me why it's so much cheaper than similar Space Walker II's of other manufacturers. Not a fan of the Space Walker? No Problem. 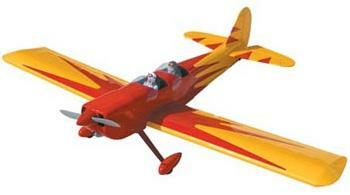 World Models makes an entire line of good quality inexpensive RC Airplanes. is another very popular inexpensive low wing trainer that makes a perfect second airplane. It's available as an ARF and requires a 40 size glow engine. Phoenix Model make all different kinds of models including sports, scale, 3D and even warbirds at very reasonable prices. Take a peak at what they have to offer.